Perhaps it is the personal dimension that makes civil wars so attractive to re-enactors in the U.K the US – the gloomy and yet paradoxically romantic concept of “a family divided” and “brother against brother”. When hundreds of ordinary folk meticulously don period garb and take up replica weaponry to replay Gettysberg and Shiloh, Worcester and Naseby, Towton and Bosworth Field, it is much, much more than a fun day out in the countryside. It might be good-natured play-acting, or participating in “living history”, but might it not also speak to some inner-need to connect with long-dead forbears who endured “the longest day” on those very fields in mortal combat with their own kith and kin. This is just one of the many thoughts that entered my head on reading a recent article in the New York Review of Books. The review is reprinted in full below, but here are a few more of my own observations. Notwithstanding the fact that civil wars are so devastating in terms of lives lost, the destruction wrought on the urban and rural environment, and the shattering of social and political institutions, fear of civil war and its consequences apparently does not deter belligerent parties from marching down that road. Often, one or another actually forces the issue, aware of the potentially disastrous consequences, but rationalizing it along the lines of national, ideological or sectional interest, and indeed, some concept of community, social, religious or ethnic survival, as happened, one could suggest, in England, in the US, Russia, Spain, and Bosnia. Sometimes, it is an accumulation of seemingly minor events, perceived slights, discrimination, actual atrocities, miscalculations, or overreactions that ignite pyres that have been building for ages – generations even. I think of Lebanon here, and Syria. So often, causus belli that are in hindsight viewed by historians as pivotal, are not seen as critical to the participants, and indeed, many would protest that they had “no idea that things would come to this”, and that even then, there may have been a sense that wiser heads would prevail, that it would blow over or that it would be all over soon. Lebanon and Syria, again, and perhaps even the slave states that sought to secede from the Union, and the parliamentarians who challenged the royal prerogative. But one can be damn sure Generalissimo Franco knew what he was doing when he flew the Spanish Foreign Legion with its Moorish mercenaries to the mainland in 1936, as did Leon Trotsky when he unleashed the Red Army against the Whites. A civil war can spawn from a wider, ongoing conflagration when factions or parties dispute the nature and terms of the post-bellum status quo and fracture along political and ideological lines. The Paris Commune after the Franco-Prussian War, for example, and Ireland after the Anglo-Irish treaty that concluded the rebellion against British rule. The experience, cost, and legacy of civil war is often a powerful political and social disincentive to venture there again. It is this fear that probably prevents Lebanon from falling back into the abyss notwithstanding the many centrifugal forces at play in this perennially divided country. It most probably had a powerful influence on the political development of post-bellum England. The next and ultimate showdown between crown and parliament, and indeed “regime change” as we now call it, was a peaceful one, and indeed, was thus named the “Glorious Revolution”. The spectre of the Commune haunts still the French soul. The beautiful church of Sacre Coeur was built as a penance for and as a solemn reminder of the bloodletting in much the same way as Justinian raised the glorious Hagia Sophia in Constantinople as a form of contrition after his soldiers had slaughtered tens of thousands of his rebellious citizens and buried their bodies under the Hippodrome. There is a view that civil war can be retrospectively be seen as a crucible of nation, a fiery furnace through which the righteous must walk – an ex post facto rationalization of the Nietzschean paradox of “that which does not kill us makes us strong”. Abraham Lincoln verbalized this in his Gettysberg Address on a battlefield where the fallen had been only recently interred. Franco made a similar play as he laid claim to the wreckage that was Spain in the wake of three years of carnage, but then petrified his riven, country in autocratic stone until his death many decades later. The Russian Civil War was not a accorded such a nation-building ethos as it was viewed by the Bolshevik victors as the crushing of a counter-revolution against a new world already being born? And finally, to conclude this conversation, lets briefly contemplate the article’s discussion of how and when protagonists actually define their internecine conflict as civil war. The American Civil War is a case in point, referred to at times as “The Rebellion” and “The War Between the States”. The American War of Independence, also know as The American Revolution was indeed a civil war as defined by the author, fought along political lines by people who had race, faith, culture and identity in common. The English Wars of the Roses, which staggered on for thirty years in in the fifteenth century is largely viewed as a dynastic struggle between noble houses rather than civil wars per se. And yet, nearly thirty thousand Englishmen died on the snow-swept fields of Towton, near York, the largest loss of English lives on a single day (a third more than perished on the first day of the Somme in June 1916). 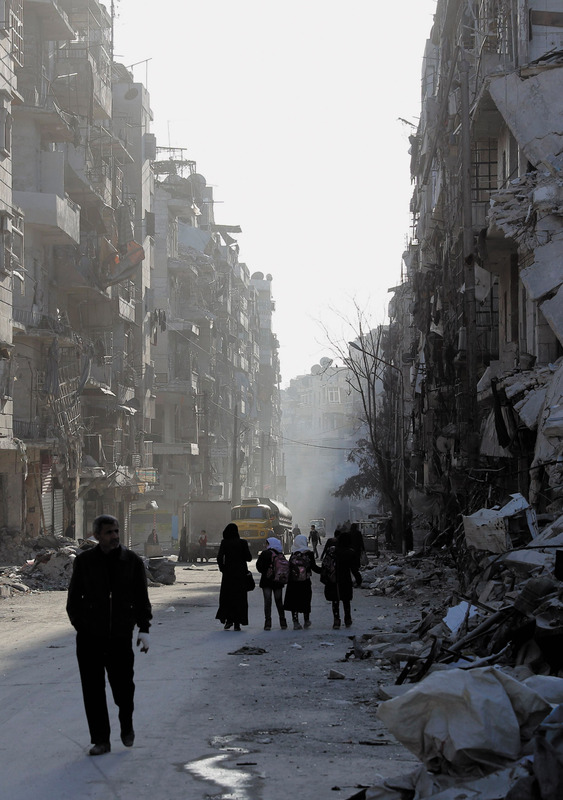 The Syrian tragedy, as the author notes, is regarded by the concerned, and hypocritically entangled outside world, a civil war by any definition. But it is at present a harrowing work in progress, viewed by the Assad regime and its supporters as a rebellion and as an assault by extremist outsiders, and by the rebel forces, as a revolution, albeit a comprised and even hijacked one. Jihadis for their many sins, see it as a messianic prelude to Armageddon. The end of the world is on view at Philadelphia. Hurtling across a twenty-five-foot-wide canvas in the Pennsylvania Academy of the Fine Arts are the Four Horsemen of the Apocalypse. Together, Death, Pestilence, Famine, and War ravage the earth amid blood-red banners and what looks like cannon smoke. Warriors fall before their swords and spears, and women, children, and babies are slaughtered. Benjamin West completed this version of Death on the Pale Horse in 1817, two years after the Battle of Waterloo. It is tempting therefore to see in the painting not only the influence of the book of Revelation, and perhaps the elderly West’s intimations of his own imminent mortality, but also a retrospective verdict on the terrible catalogue of death and destruction that had been the Napoleonic Wars. Yet West’s original inspiration seems to have been another conflict. He first sketched out his ideas for Death on the Pale Horse in 1783, the concluding year of the American War of Independence. Bitterly divisive on both sides of the Atlantic, the war imposed strains on West himself. Pennsylvanian born and bred, he was a supporter of American resistance. But in 1763 he migrated to Britain, and he spent the war working as a historical painter at the court of George III. So every day he served the monarch against whom some of his countrymen were fighting, knowing all the while that this same king was launching his own legions against Americans who had once been accounted British subjects. It was this tension that helped to inform West’s apocalyptic vision. More viscerally than most, he understood that the American Revolution was also in multiple respects civil warfare. Tracing some of the histories of the idea of civil war, and showing how definitions and understandings of this mode of conflict have always been volatile and contested, is the purpose of this latest book by David Armitage. Like all his work, Civil Wars: A History in Ideas is concise, wonderfully lucid, highly intelligent, and based on a confident command of a wide range of printed sources. It is also ambitious, and divided into three parts in the manner of Julius Caesar’s Gaul. This seems appropriate since Armitage roots his account in ancient Rome. It was here, he claims, between the first century BCE and the fifth century CE, that lethal conflicts within a recognized society, a common enough experience in earlier eras and in other regions, began to be viewed and categorized as a distinctive form of war: bellum civile. But why ancient Rome to begin with? Armitage attributes its centrality to evolving Western conceptions of civil warfare partly to this culture’s marked success in establishing and stabilizing the idea of a distinct citizenry and political community. “Civil War could, by definition, exist only after a commonwealth (civitas) had been created.” More significant, as far as perceptions in later centuries were concerned, were the writings and careers of two brilliant Romans, each of whom in different ways was caught up in the rivalry between Julius Caesar and Pompey and destroyed by the violence of their warring successors. Cicero, an opponent of Caesar, is the earliest-known writer to have used the term “civil war.” He also employed it in a speech that he delivered at the Forum in 66 BCE, close to the spot where his severed head and hands would be put on display twenty-three years later, as punishment for his activism and his words. In the following century, the youthful poet Lucan completed a ten-book masterwork, De Bello Civile, on how, under Caesar, “Rome’s high race plunged in her [own] vitals her victorious sword.” Lucan dedicated his saga to Nero, the emperor who later forced him to commit suicide. Their writings and the gory fate of these men helped to foster and perpetuate the idea that civil warfare was a particularly nasty variant of organized human violence. It is in part this reputation, Armitage contends, that has made the subject of civil war a more impoverished field of inquiry than inter-state conflict. Given that the English, American, and Spanish civil wars have all long been historiographical cottage industries, I am not sure this is wholly correct. But it is the case, and he documents this powerfully throughout, that the ideas and negative language that have accumulated around the notion of “civil war” have resulted in the term’s use often being politically driven in some way. As with treason, what gets called civil war, and becomes remembered as such, frequently depends on which side eventually prospers. At times, the term has been deliberately withheld for fear of seeming to concede to a set of antagonists even a glimmer of a claim to sovereignty in a disputed political space. Thus the royalist Earl of Clarendon chose in his history to describe the English Parliament’s campaigns against Charles I after 1642 not as a civil war, but as a rebellion. In much the same way, an early US official history of the Union and Confederate navies described their encounters between 1861 and 1865 as a “War of the Rebellion,” thereby representing the actions of the Southern states as a mere uprising against an indisputably legitimate government. As a searching, nuanced, and succinct analysis of these recurring ideas, linguistic fluctuations, and shifting responses over a dramatic span of time, and across national and continental boundaries, Armitage’s account is a valuable and suggestive one. But as he admits, it is hardly comprehensive. This is not simply because of the scale of his subject matter, but also because of his chosen methodologies. In dealing with civil wars he practices what, in an earlier work, he styled “serial contextualism.” This means that he offers detailed snapshots of a succession of discrete moments and of particular intellectual, political, and legal figures spread out over a very long stretch of time. The strategy is sometimes illuminating, but one has to mind the gaps. Most obviously, there are difficulties involved in leaping, as he does, almost immediately from ancient Rome to the seventeenth century. By the latter period, for instance, England’s “Wars of the Roses” were sometimes viewed and described in retrospect as civil wars. But at the time, in the 1400s, commentators do not seem to have resorted to medieval Latin phrases such as bella civilia or guerre civiles to describe these particular domestic and dynastic conflicts. Although classical texts such as Lucan’s De Bello Civile were known to medieval scholars, the impress of this ancient Roman inheritance on contemporary interpretations of fifteenth-century England’s internal wars does not appear to have been a vital one. Why might this have been? The question could be rephrased. Why should it be imagined that language and concepts drawn from the ancient Roman past supplied the only or even the dominant ideas and methods for subsequent Westerners wanting to make sense of the experience of large-scale civil contention and slaughter? After all, in the medieval era and long after, most men and even more women possessed no direct knowledge of the Roman classics. Multitudes in Europe and everywhere else could not even read, never mind afford books. Yet in the past as now, it was precisely these sorts of “ordinary” people who were often the most vulnerable to the chaos and bloodshed of civil warfare, and so had little choice but to work out some ideas about it. What were these ideas? A practitioner of intellectual history from the so-called Cambridge School of that discipline, Armitage barely touches on such questions. More international in range than many of his fellow scholars, he shares some of this school’s leading characteristics: its fascination with the long-term impact of Aristotelian and Roman republicanism, its overwhelming focus on language and on erudite elite males, and its comparative neglect of religious texts. It is partly this deliberately selective approach to the past and its sources that allows Armitage to venture on such an enormous topic over such a longue durée. But again, there is a mismatch between this methodology and the full extent and vital diversity of his subject. To be sure, many of the impressive individuals who feature in his book were much more than desk-bound intellectuals or sheltered and austere political players. One of the most striking segments in Civil Wars is Armitage’s treatment of the multiple roles of the Prussian-born American lawyer Francis Lieber, who provided Lincoln with a legal code for the conduct of the Civil War. Lieber had fought at Waterloo and was left for dead on the battlefield. During the 1860s, he also had to bear the death of one of his sons who fought for the South, even as two others were fighting for the North. As he remarked: “Civil War has thus knocked loudly at our own door.” The fact remains, however, that most men caught up in civil wars throughout history have not been educated, prosperous, and high-achieving souls of this sort. Moreover—and this has a wide significance—civil wars have often been viewed as having a particular impact on women. In harsh reality, even conventional warfare has usually damaged non-combatants, women, children, the elderly, and the infirm. Nonetheless, the idea long persisted that war was quintessentially a separate, masculine province. But civil wars were seen as taking place within, and cutting across, discrete societies. Consequently, by their very nature, they seemed likely to violate this separation of spheres, with women along with children and the old and frail all patently involved. This was a prime reason why civil warfare was so often characterized in different cultures not just as evil and catastrophic, but as unnatural. In turn, this helps to explain why people experiencing such conflicts have often resorted, far more avidly than to any other source of ideas, to religious language and texts for explanations as well as comfort. The major holy books all contain allusions to civil warfare and/or lines that can be read as addressing its horrors. “I will set the Egyptians against the Egyptians,” declares the King James version of the book of Isaiah: “and they shall fight every one against his brother, and every one against his neighbour.” It was often the Apocalypse, though, as demonstrated by Benjamin West’s great canvas, that Christians mined for terrifying and allusive imagery. Such biblical borrowings sometimes crowded out references to the Roman classics as a means of evoking and explaining civil war altogether, as seems often to have happened in medieval England. Neglects her worke to worke in us remorse. It was never just Christians who turned to holy books and religious pieties so as to cast some light on the darkness of civil war. Unlike allusions to the Roman past, such responses seem to have been universal. Indeed, I suspect that the only way that a genuinely trans-continental and socially deep history of civil warfare could conceivably be written would be through an examination of how civil wars have been treated by the world’s various religions, and how such texts and interpretations have been used and understood over time. In particular, the idea that Samuel Daniel hints at in the passage quoted above—that civil war was a punishment for a people’s more than usually egregious sins—has proved strikingly ecumenical as well as persistent. Thus for Sunni Muslims, the idea of civil war as fitna has been central to understandings of the past. But fitna in this theology connotes more than civil warfare. The term can evoke sexual temptation, moral depravity—once again, sin. The First Fitna, for instance, the war of succession between 656 and 661, is traditionally viewed by Sunnis as marking the end of the Rightly Guided Caliphs, the true followers of Muhammad. As Tobie Meyer-Fong has shown, the civil wars that killed over twenty million Chinese in the 1850s and 1860s, the so-called Taiping Rebellion, were also often interpreted as divine retribution for immoral, decadent, or irreligious behavior. * Confucian, Daoist, and Buddhist commentators on all sides rationalized the carnage and disorder in these terms. Poor, illiterate Chinese caught up in this crisis seem also to have regularly turned to religion to make sense of it, and not simply out of faith, or as a means to explain apparently arbitrary horrors. By viewing civil war as punishment for Chinese society’s sins in general, they could also secure for themselves a strategy and a possible way out, even if only in spiritual terms. They could make extra and conscious efforts to follow a moral pathway, and hope thereby to evade heaven’s condemnation. Where a philosopher, a lawyer, or even a political scientist might find only confusion in disputes over the term “civil war,” the historian scents opportunity. All definitions of civil war are necessarily contextual and conflictual. The historian’s task is not to come up with a better one, on which all sides could agree, but to ask where such competing conceptions came from, what they have meant, and how they arose from the experience of those who lived through what was called by that name or who have attempted to understand it in the past. Certainly, a close reading of Civil Wars provides a deeper understanding of some of the semantic strategies that are still being deployed in regard to this mode of warfare. Thus President Bashar al-Assad and his supporters frequently represent Syria’s current troubles as the result of rebellion, revolt, or treason; while for some of his Russian allies, resistance in that country is to be categorized as terrorism. But historians can illumine the rash of civil warfare that has characterized recent decades more deeply than this. Whereas Armitage focuses here on the making and unmaking of states, it is the rise and fall of empires that have often been the fundamental precipitants of twentieth- and early-twenty-first-century civil wars. At one level, the decline and demise of some old, mainly land-based empires—Austrian, Ottoman, and Soviet—have contributed to a succession of troubles in Eastern Europe. At another, the old maritime empires that invaded so much of Asia, Africa, and the Middle East frequently imposed new boundaries and yoked together different peoples in those regions in ways that were never likely to endure, and stoked up troubles for the future. In these and other respects, Armitage is right to insist that history can equip men and women with a better understanding of the past and of the troubled present. It always has done this. But only when its practitioners have been willing to adopt broad and diverse and not just long perspectives. 1.Tobie Meyer-Fong, What Remains: Coming to Terms with Civil War in 19th Century China (Stanford University Press, 2013).